More and more people are relying less on newspaper and magazine articles and turning instead to the internet for information when deciding on what books to read and movies to see. Sites like Amazon, Facebook, GoodReads, LibraryThing and a host of independent blogs and journals are becoming more trusted than the New York Times. Reviews have always been notorious for their corruption. Some are paid for, others written out of obligation; publishers make deals, pacts are agreed on by mutual authors. But it is hard to control the opinions of hundreds of people posting on Amazon or on their own websites. Sure there are the “friends and family” posts you need to look out for, but how many of those can there be? With the proliferation of reviews on the Internet, the truth is impossible to suppress for long. There are a handful of intrepid bloggers that don’t receive a paycheck and all they have is their reputation. Big publishers have resources and connections to roll out a title and ensure it is seen. Independents, don’t and are ignored by “reputable” reviewers and shunned out of hand, even by libraries (because they don’t have “reputable” reviews.) Readers buy the big titles, sometimes because it is all they know exists. Given this, reviews, even small ones posted by first timers make a difference. There are many books that have one review on Amazon, books that if you do a global search across the Internet turn up nothing. Potential readers mark this as a red flag and pass. As it happens, my family is a bit on the older side and I’m certain they think there are evil spirits in computers, so they stay away from them. I’ve moved a few times, which limits the number of friends I can pressure. To date, there’s about three or four who actually wrote a review on Amazon for Crown Conspiracy—none for Avempartha. Since I am published through a very small, independent house, I shouldn’t stand a chance. My only hope is for people to notice me and spread the word, but am one guy waving my hand in a sea of millions—but you have helped. “I knew once I started reading I would not be able to stop. Saturday arrived. I put my phone on vibrate, sent the boys to the patio and sat back to read my precious, (Avempartha), cover to cover. I had high expectations and Michael Sullivan surpassed them. // Thank you Michael for such a wonderful series. I'm eagerly anticipating your next installment. I have it marked on my calendar and once again I'll be ordering it as soon as you release it.” –Sarah, GoodReads. I don’t know any of these people, and I can’t rationalize any reason why they, or any of you would lie, so I have to believe that you mean what you say, just as I hope others will. I’m sure most of you think, “what the heck, sure I’ll take a second to say I liked it. Why not.” But I doubt you truly realize how much I appreciate it. I actually have a few of these taped to my walls, and I re-read them, perhaps more than I should. You see, I’ve never been motivated much by money or false praise, but real recognition is like gas on fire—that makes me want to sit down and work. That makes me want to be a better writer. So I want to tell everyone who wrote a review, mentioned the books on a forum, or told a friend—thank you so very much, you make my dreams come true. Just a short follow-up to RavenCon. 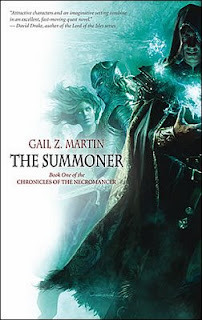 While there I met Gail Martin author of Chronicles Of The Necromancer. who was in the process of doing short author interviews of many of the writers in attendance at RavenCon with her hand-held video camera. She got to me near the end of the weekend so I appear a bit more than three quarters through the video that she has now posted. So if you are curious to see me talk, or interested in seeing a bit of the madness of RavenCon check out Gail's video.